The annual fall hike in the Town of Waynesville’s 9,000-acre watershed took place on Saturday October 29. Around 25 stalwart hikers showed up despite the cold, wet and windy Friday overnight and socked-in, iffy-looking conditions Saturday morning, to see and learn a little about this marvelous resource that the town has preserved through conservation easements. Dr. Peter Bates, natural resources professor from Western Carolina University and I led the hike. Bates has been involved with the watershed easements from the beginning and has helped lead a team of biologists and scientists in creating the town’s watershed management plan. I highly recommend that anyone interested in learning about the past and present condition of the watershed landscape and/or the philosophy and science regarding the town’s management plan join one of Bates’ hikes. For my part, I’m there to try and help people see and appreciate the native flora and fauna of the watershed. My trips are “ambles” not hikes. We may stop to track down a warbler that sang from the treetops or to examine a wildflower or turn a stone alongside a stream bank to see what we can see. My group, last Saturday, was shuttled in to where Allen’s Creek empties into the reservoir and hiked back out to the treatment plant. It was a relatively easy, mostly flat (for the mountains) hike of between two to three miles. We were greeted by a few snowflakes at the beginning of the hike, but it was short-lived and the clouds gave way to sunshine. The wind, however, buffeted us most of the day, filling the air with colored leaves. There were a few places during the hike, where we could see the mountaintops, covered in hoar frost and gleaming in the sunlight. We saw some outstanding fall color up close and were able to gain a little appreciation for the subtle differences that can create dramatic red on one maple and golden yellow on another almost side by side. Most wildflowers were spent but it was easy to identify goldenrod, ladies’ tresses and others by the spent flowers and remaining stems. A few asters were still blooming. We saw heart-leaved aster, white wood aster and one large purple (lavender) aster that I immediately thought was New England aster because of its size but in retrospect could have easily been late purple aster, Aster patens. We also found one lingering gentian. While there were no binocular-toting birders on the trip, aside from yours truly, there was a general interest. I was surprised at some of the lingering migrants we encountered, including Swainson’s thrush, pine warbler and palm warbler. There was also a group of about a dozen blue-winged teal on the reservoir and the juncos and golden-crowned kinglets had already found their way down to the lower elevations. Despite the cool temperatures, a little stone turning near one of the creeks in the watershed turned up a two-lined salamander. 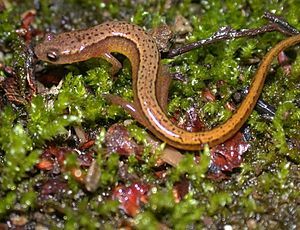 It’s one that I call Eurycea wilderae, the Blue Ridge two-lined salamander, although, I think the whole group (northern two-lined, southern two-lined and blue ridge two-lined) is still in flux as to what may be species, sub-species, races etc. Another amphibian we encountered was a small (this year’s) American toad. These watershed hikes are always a wonderful way to get outside. And getting outside in these mountains is always an enjoyable experience. If you are a Waynesville resident, these hikes allow you an up close look at this outstanding resource the town (you) owns. The town is charged with protecting its outstanding water quality and that will always be its focus. The town is also cautiously and carefully exploring the future of this watershed and as an informed and engaged resident of the town of Waynesville you owe it to yourself and future generations to learn about the watershed and be a part of shaping its future. Now to start rumors, I understand that next spring’s hike may offer a brand new option, but the cat’s still in the bag for now.